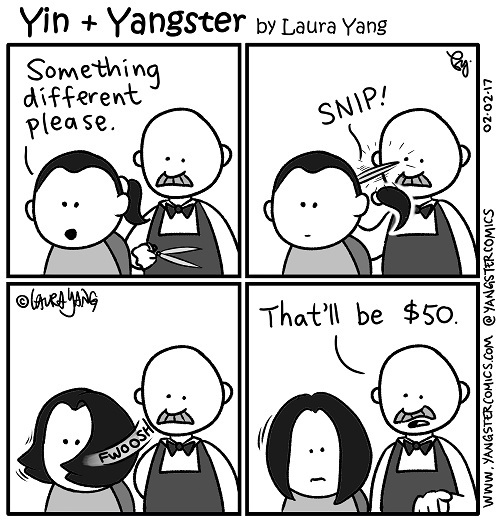 I’ve always wanted to cut my hair drastically short but I suppose I’ve resisted since it sort of hearkens back to my early childhood days courtesy of my Chinese father. I remember not so fondly once in grade 7 my dad decided to give me the usual rice bowl cut. When it came time to do my bangs, he kept messing up and had to cut higher and higher until voila! I had bangs no more, just tiny stubble that protruded from my forehead. Added to the fact that I had a pretty round and chubby face, this cut was NOT flattering whatsoever. After he finished cutting my hair, I looked into the mirror and cried. I was traumatized. It was during the summer when I had lots of sun exposure so the complete annihilation of my bangs meant you could now clearly see the untanned part of my forehead. To add to my distress, my dad started chuckling uncontrollably. Needless to say, that was the last time he would ever touch my hair. So fast forward about a quarter century… I always tell the hair stylist to cut it short, so long as I can tie it. However, recently a good friend persuaded me to get rid of the ponytail. Now I feel young again… 10 to be exact.